I had the pleasure of reading and reviewing the opening book in the Orfeo Saga, The Sword of Telemon, which introduced Murray Lee Eiland Jr.'s distinctive signature of excellent prose, unique phraseology, and complex characters. The Slave Boy, the sixth book in the installment, did not disappoint. If anything, the author has simply stepped up the game, introducing a very complex plot with sophisticated characters. 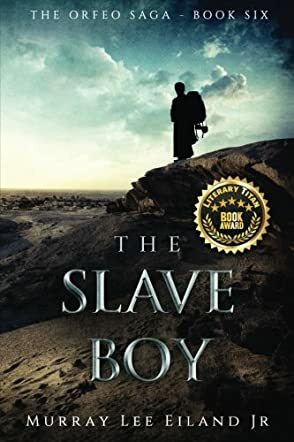 The Slave Boy tells the story of an ex-double agent, Cyrus, with his friend Balik, who set out on a trip to Elam where they intend to offer their services as spies for merchants, but end up getting sold into slavery. It is exciting to read about the intrigue, their adventures fraught with danger, the unusual plan including Arya, a gorgeous daughter of a general, and Cyrus’s plan to stop Cabul from falling into siege. This is the kind of story for readers who love thrillers with characters who easily find themselves in tight situations. Cyrus is a character that readers will love to follow and although a lot of wrong things happen to him and around him, he always manages to stay ahead of his enemies. There is a lot of action in this thriller, a lot of fights, and the kind of intrigue that spices up the conflict in a plot. Murray Lee Eiland Jr. writes excellently and readers can’t resist falling for his elegant prose, the setting that recreates elements of the history of the Middle East and its general political climate, and a plot that is wholly unpredictable. The Slave Boy is a hard-to-put-down story, one that will have the reader’s heart racing until the end. Absorbing! For Cyrus, his life once the country is free from war is not what he had hoped and expected. Rather, he finds himself bored and looking for a new adventure. Being captured as a slave, spending his time fighting in wars for someone else’s pride, and even finding the woman he’s dreamed of were definitely not his expectations of the new adventure, but all of that and a whole lot more are waiting for him as he travels throughout the country. And just maybe, he’ll find some even bigger surprises and adventures along the way, enough to satiate him for a lifetime in The Slave Boy by Murray Lee Eiland Jr. If you’re looking for a book that’s full of adventure, then you’re definitely going to like The Slave Boy. This book is full of all kinds of adventure and all kinds of intrigue at the same time. Cyrus, Rama, Balik, Sharmilla and all the rest are characters that you’ll want to read more about (and you can because there are plenty of other books about them). There’s just the right hint of romance going on and there’s plenty of everything else. You won’t get bored (even if you’re not into romance) and you definitely won’t have a problem finishing this book. I didn’t want to stop reading it once I started and neither will you. This is one book I will be recommending to others I know who like a lot of adventure and action. In Murray Lee Eiland Jr.'s new book, The Slave Boy: The Orfeo Saga volume 6, readers will enjoy the continuing saga of Cyrus, a man bored with his easy life after spending many of his recent years as a merchant and a spy. He leaves his easy life to meet up with his old friend, Balik, who is also looking for a change in life. Together, they venture to their old stomping grounds in Elam and prepare themselves for new adventures in their old careers as merchants and spies. Things go awry and the two find themselves sold into slavery. Through their own cunning, they are able escape, and become the leaders of a group of ex-slaves. Together with them, they end up on various exciting missions, including one that just might save many people from the horrors of war. The Slave Boy is a highly engaging read that will keep readers obsessively turning the pages from the start all the way through until the very end, many times from the edge of their seats! Author Murray Lee Eiland, Jr. has done a good job in creating characters that his readers will connect with and relate to, not an easy feat in such an adventurous read and in so many exotic settings. Readers who like exciting stories packed full of adventure and thrills would definitely enjoy this book. I can certainly recommend The Slave Boy to any such reader, and look forward to reading more in the Orfeo Saga Series just as soon as they are available!